American President Donald Trump’s decision to dismiss the FBI director led to calls for an independent investigation into Russian interference with the 2016 presidential election. James Comey, the dismissed FBI director, had told Congress his agency is investigating if people connected to Trump’s presidential campaign played a part in Russian election interference. Some Democrats said the firing of Comey reminded them of President Richard Nixon’s “Saturday Night Massacre” in 1973. That is when Nixon ordered the firing of Archibald Cox. Cox was leading the investigation into a break-in at Democratic Party headquarters at the Watergate building in Washington, D.C.
“Not since Watergate have our legal systems been so threatened…” said Senator Richard Blumenthal, a Democrat from Connecticut. 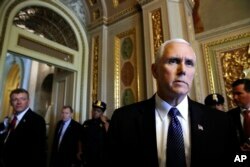 Vice President Mike Pence said Wednesday that the president showed “strong and decisive” leadership and that the dismissal had nothing to do with the Russian investigation. Vice President Mike Pence talks to reporters at the U.S. Capitol. 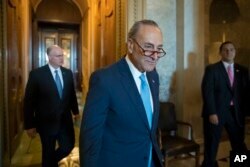 Senate Democratic Leader Chuck Schumer said dismissing the person overseeing the Russian investigation requires an independent prosecutor. Senator Chuck Schumer at the Capitol Wednesday. Senate Majority Leader Mitch McConnell and other Republicans said no independent investigation is needed. Even without Comey, the FBI’s Russian investigation would continue, as would investigations by Congress, they said. At least 12 Republican senators expressed concern with Comey’s dismissal by Trump, especially why the decision was made now. A spokesman for Trump said the president met on Monday with the attorney general and the deputy attorney general to discuss their concerns about Comey. Trump then asked the two top officials in the Justice Department to report their concerns and recommendations. In his report, Deputy Attorney General Rod Rosenstein wrote that Comey “made serious mistakes” in the investigation into Clinton’s handling of emails as U.S. Secretary of State in the Obama administration. He criticized Comey for announcing just 11 days before the election that his agents were taking another look at newly found Clinton emails. “Almost everyone agrees that the director made serious mistakes; it is one of the few issues that unites people” of different political opinions, Rosenstein said. On Wednesday, The New York Times and other news organizations reported that just days before his dismissal, Comey had asked Rosenstein for more money for the Russian investigation. As a candidate, Trump praised Comey for his public criticism of Clinton. But he also said Comey was wrong not to move to charge her with crimes. On Wednesday, Trump defended his decision to dismiss Comey and criticized his critics in a series of tweets. Bruce Alpert reported on this story for VOA Learning English based on reports by VOA News, the Associated Press, Reuters and other sources. Hai Do was the editor. We want to hear from you. Write to us in the Comments Section and share your views on our Facebook Page. Do you think Trump was right to fire the FBI director?